This came into effect on 17 September. 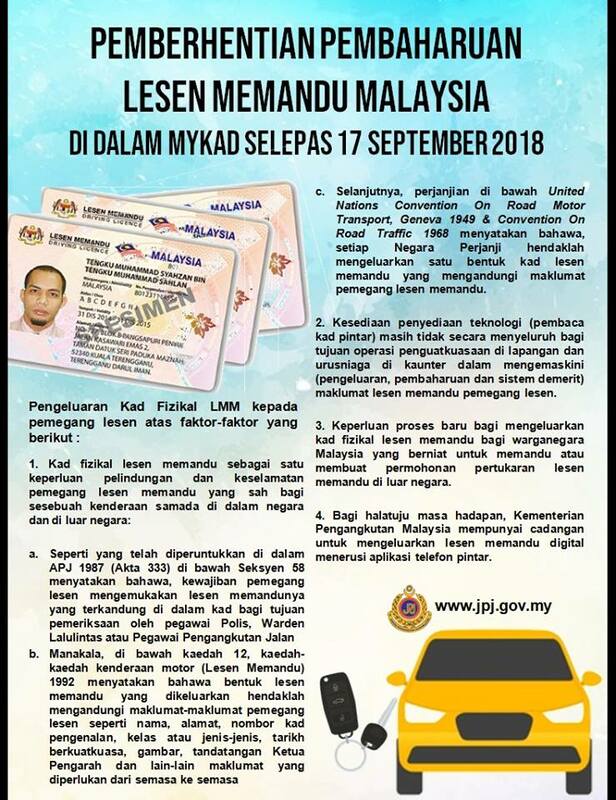 According to its Facebook post, Jabatan Pengangkutan Jalan Malaysia (JPJ) has decided to remove all driving license details from the electronic chips of MyKads. 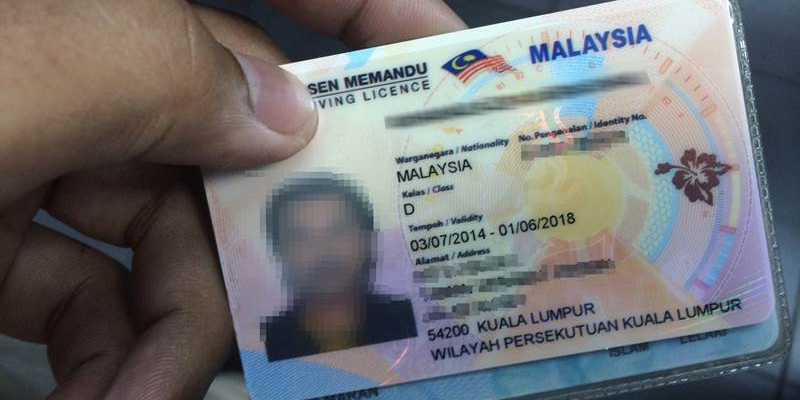 Previously, Malaysians could store their driving license details in their MyKads so they do not have to carry both cards. However, they are now required to carry around their physical driving licenses. "Renewing your driving license via MyaKad is no longer available from tomorrow (17 September) onwards." "Renewal can only be done with your physical driving license." a. As stated in Section 58 of the Road Transport Act 1987 (Act 333), any person in charge of a motor vehicle on a road shall, on being so required by any police officer, any traffic warden or any road transport officer, produce his driving license for inspection by such officer. b. Meanwhile, under the driving license procedure 1992, it states that the driving license must include the information of the license holder like their name, address, MyKad number, vehicle class or type, validation date, picture, the signature of the head director, and other important information. c. The United Nations Convention On Road Motor Transport in Geneva 1969 stipulates that every country involved in the agreement has to produce a physical form of the driving license that states the information of the license holder. 2. Technology of the chip reader, which is not widely available for operation at ports and counters, is not advanced enough to handle updates such as license production, renewal, and the demerit system. 3. A new process is needed to give Malaysians their driving licenses so that they are able to drive or request for a driving license overseas. 4. The Transport Ministry has plans to roll out digital driving licenses through a mobile application. "Must they really upgrade the system? It's better to upgrade the service. Everyday there's a long queue and you even have to come the next day sometimes. They should look into that part first." "Posted twice and people still don't get it. Have sentences that are short and simple. You don't have to do essays like a novel." Over 3,000 Indian senior citizens with red ICs will receive their MyKad. The Transport Ministry announced a set of new regulations for the e-hailing industry yesterday, 11 July. The information was revealed by Health director-general Datuk Dr. Noor Hisham Abdullah yesterday, 18 September. 33 people were hospitalised for suspected alcohol poisoning as well.